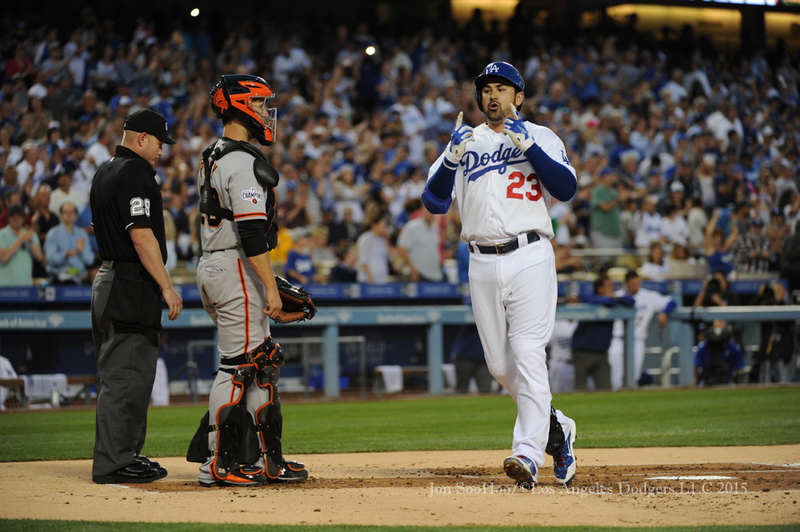 Adrian Gonzalez is having a great start and has been highly regarded among Major League first baseman for quite some time. But there hasn’t been much focus in the media on where Gonzalez will ultimately rank among the all-time greats. 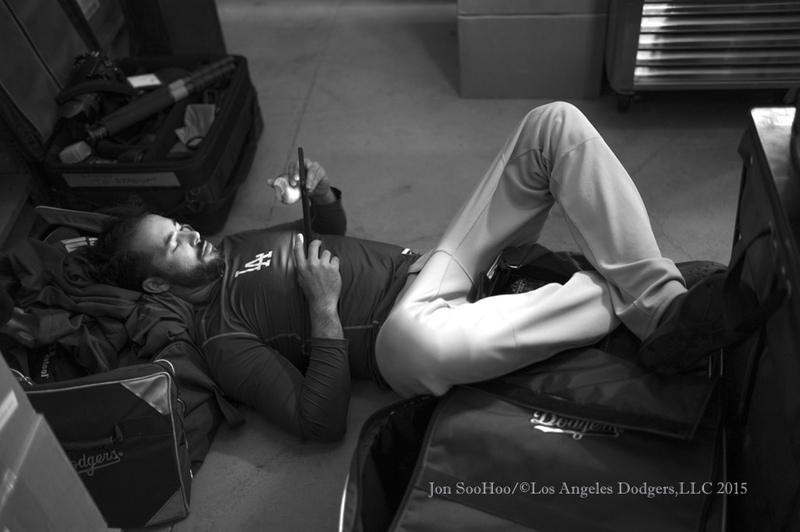 In the May issue of Dodger Insider magazine, Cary Osborne explores Gonzalez’s potential legacy, highlighted by Gonzalez being on track to become one of the top 25 first basemen of all time. 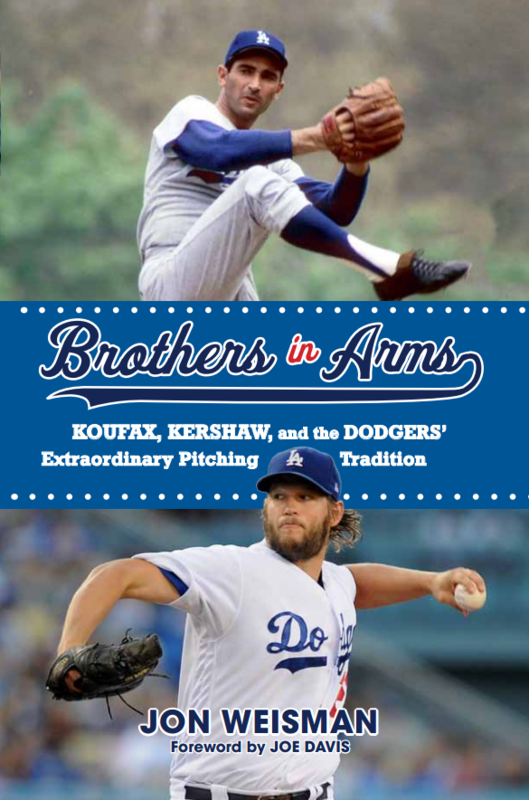 The cover story is one of more than two dozen features in the latest issue of the blog’s companion publication, which will be on sale at all Dodger Stadium stores beginning Friday. Other top stories are highlighted at right, along with our usual collection of Dodger history, news, notes, photos and more. 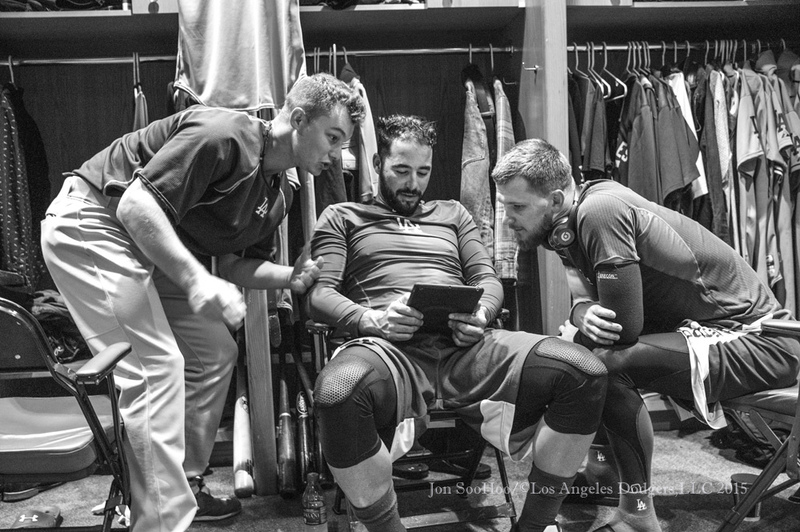 It’s Dodger past, present and future in one great 152-page package. 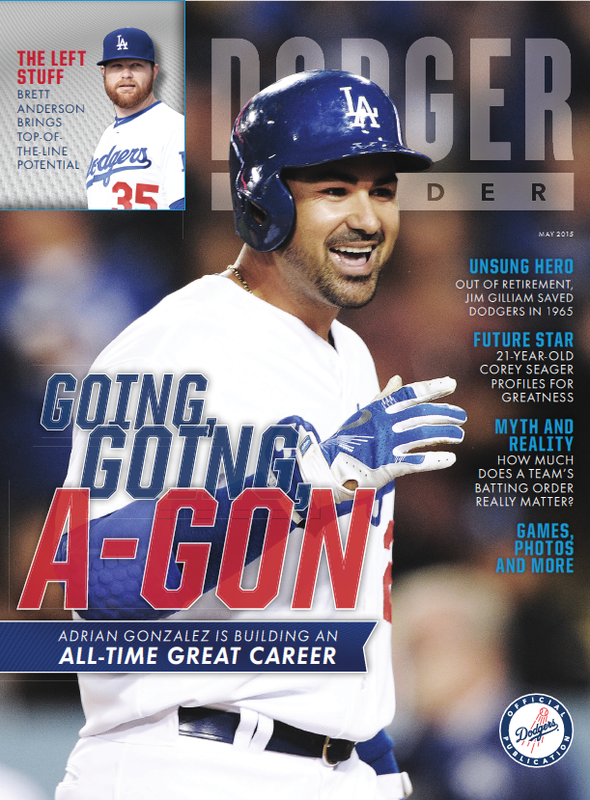 To subscribe to Dodger Insider, visit dodgers.com/magazine. Orders taken through May 11 will begin with the June issue. For more images from Wednesday, visit LA Photog Blog. “On pace.” Is there any more beguiling, teasing, misleading two-word construction than you? You engage and mock us all at once. But with the Dodgers clubbing four home runs in their final game of April, a 7-3 victory Wednesday over San Francisco, let’s start today with some off-day amusement. 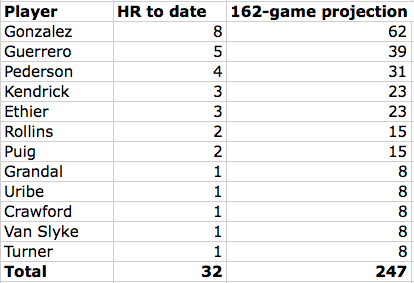 Yes, that projection has Adrian Gonzalez and Alex Guerrero combining for 101 home runs. On the other hand, two of the biggest power players in the Dodger lineup, Yasiel Puig and Yasmani Grandal, have barely gotten going. Who knows what the future holds, but the power display has been fun to watch for fans of the Dodgers, who played .619 ball in April, putting them on pace for … 100 wins. 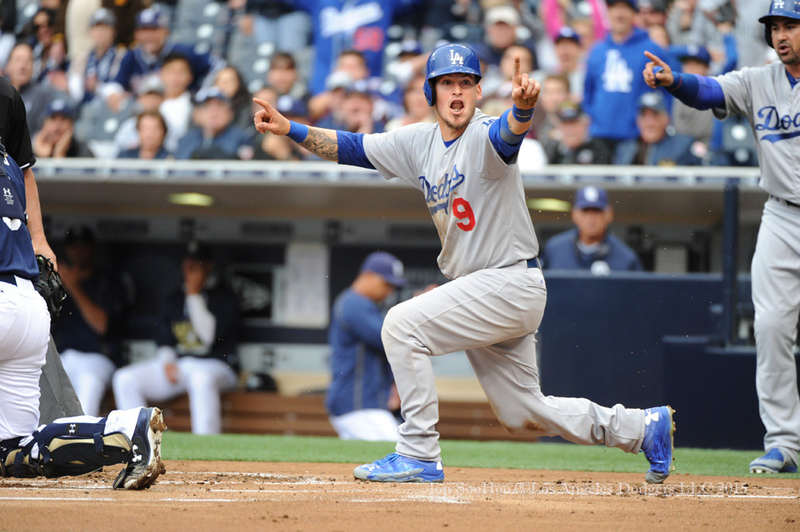 Prediction: @yungjoc650 starts in seven different spots in the batting order during the 2015 regular season. For photos from Tuesday, visit LA Photog Blog – here and here. Notes: Don Mattingly told reporters that Carlos Frias would start Friday’s game against Arizona and Scott Baker would start Saturday. In addition, Brandon McCarthy confirmed to reporters he will undergo Tommy John surgery Thursday, with Dr. Neal ElAttrache performing the operation. Five weeks ago, I tweeted out the above prediction about Joc Pederson roaming the Dodger batting order. With more than five months to go in the season, I’m nearly halfway there. Pederson, whose batting prowess this season was discussed here Sunday and Monday, has been moved up from the Nos. 7 and 8 spots to leadoff for tonight’s game. 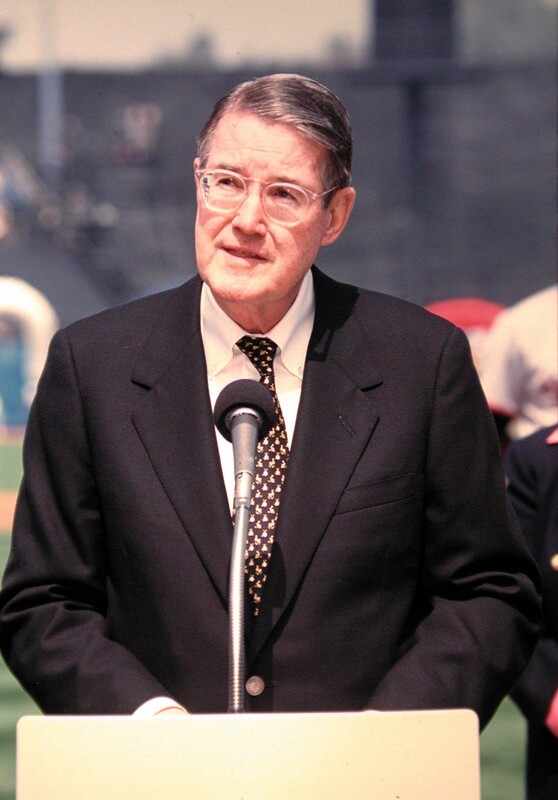 Frankly, I was tempted to bet Pederson would go nine for nine, figuring it wasn’t out of the question that he might bat ninth in an American League park, but the Dodgers don’t play a road interleague game until June 15 at Texas, and I figured Pederson’s days at the bottom of the order would be over by then. Pederson enters tonight sixth in the National League in weighted on-base average (wOBA, .428) and fourth in OPS (1.014). As noted Sunday, his stats would be impressive even accounting for the walks he has drawn batting eighth with the pitcher on deck. Will he ever reach the in-between spots of the order? Based on the Dodgers’ ever-changing roster and needs, and whether he gets increased playing time against southpaws, I wouldn’t rule it out. Despite its difficulties against Giants ace Madison Bumgarner, the Dodger offense is hardly in crisis, ranking first in the NL in wOBA and weighted runs created (wRC+) by a wide margin. But it is an oddly stratified offense through 20 games, with none of tonight’s starters offering an OPS between .680 and .880. 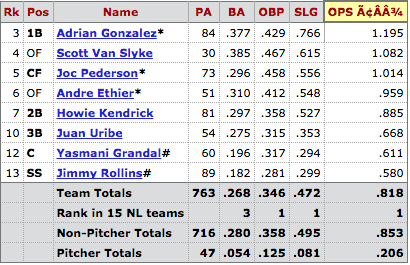 In short, as far as 2015 is concerned, there isn’t really an average player in that lineup. The AL All-Star Team will have nine elected starters via the fan balloting program, while the NL All-Star Team will have eight fan-elected starters. The pitchers and reserves for both squads – totaling 25 for the NL and 24 for the AL – will be determined through a combination of “Player Ballot” choices and selections made by the two All-Star managers – NL skipper Bruce Bochy of the defending World Series Champion San Francisco Giants and AL manager Ned Yost of the Kansas City Royals. Following the announcement of the American League and National League All-Star rosters, fans will begin voting to select the final player for each League’s 34-man roster via the 2015 Esurance MLB All-Star Game Final Vote. Fans will cast their votes from a list of five players from each League over the balloting period. 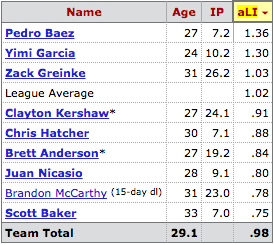 The Dodgers had four All-Stars last year, their most since 2010. 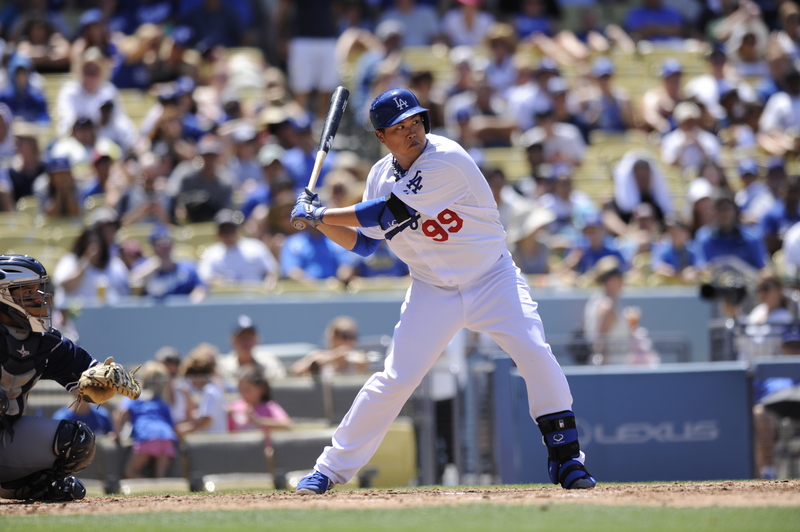 Pederson is looking to become the Dodgers’ first rookie All-Star Game participant since Hideo Nomo in 1995. Will he do it? You tell me. For more photos from Monday, visit LA Photog Blog. 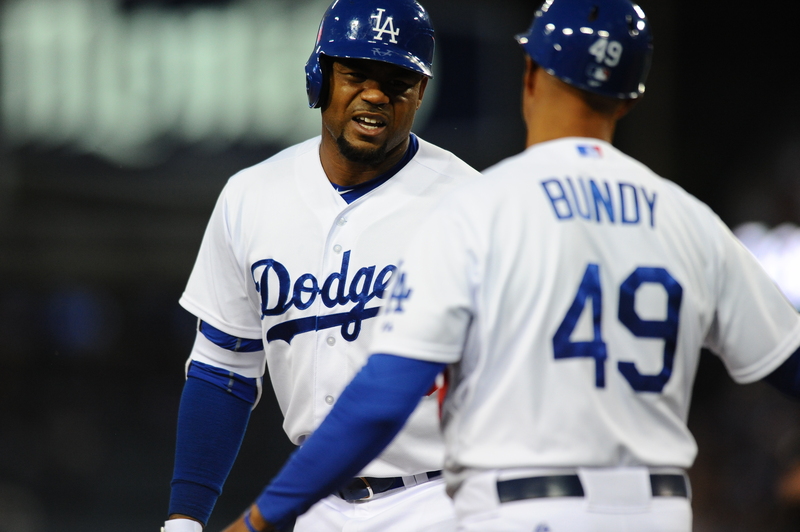 Carl Crawford has joined fellow outfielder Yasiel Puig on the disabled list with a right oblique strain, and infielder-outfielder Kiké Hernandez has been called up from Triple-A Oklahoma City. Crawford injured himself during his second-inning triple Monday, on the swing, telling Eric Stephen of True Blue L.A. today that it was a “bad tear.” He has a .260 on-base percentage and .408 slugging percentage in 50 plate appearances this season. Crawford had an even slower start (.224/.278) in April 2014, but finished last season at .339/.429. The 23-year-old Hernandez had a .321 OBP and slugged .421 in 134 plate appearances during his MLB debut in 2014. With Oklahoma City in 2015, Hernandez was at .219/.254, thanks largely to a 1-for-29 slump from April 12-20. 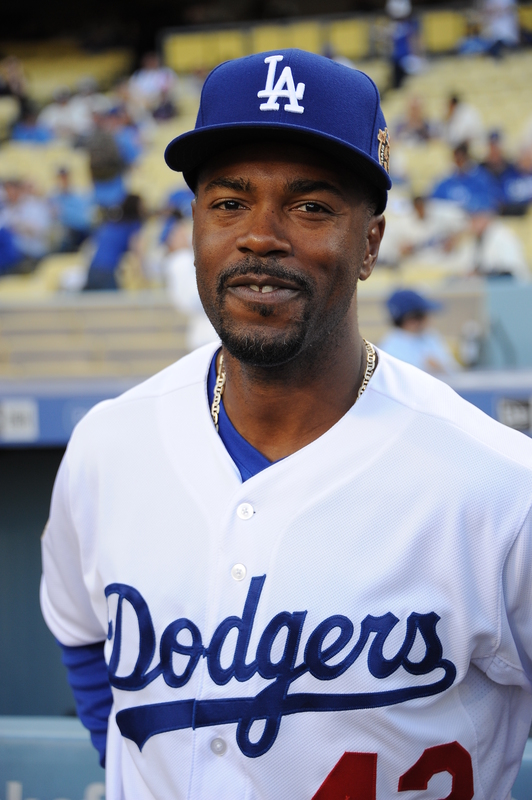 Jimmy Rollins has been nominated for the All-Stars of Giving Humanitarian Award, recognizing the efforts of professional athletes as philanthropists. Through May 15, fans can vote to choose the organization’s 10 All-Stars of Giving and then for the Humanitarian of the Year Award. Rollins, who shared baseball’s Roberto Clemente Award last year, has focused on helping children, at-risk youth and families through the Rollins Family Foundation, which is dedicated to providing families-in-need access to fresh food and nutritional education. A tough revelation this morning. 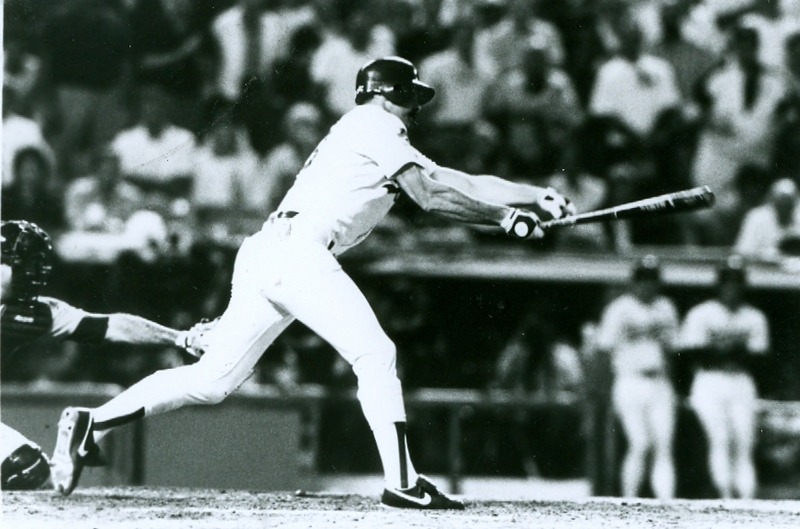 Kirk Gibson, 1988 National League MVP and World Series Game 1 hero, has been diagnosed with Parkinson’s disease. Jason Beck has more at MLB.com. Yimi Garcia pitched the eighth "to give him the toughest part of the order," Mattingly says (Pagan, Posey and Maxwell). In 1993, perhaps the most impressive rookie hitter in Dodger history, 24-year-old Mike Piazza, had a .354 on-base percentage and .520 slugging percentage in April. In 2015, 23-year-old Joc Pederson has a .458 on-base percentage and .556 slugging percentage in April. Pederson, born barely four months before Piazza made his Major League debut in 1992, again rewarded the Dodgers’ faith in him entering this season, hitting a double and a home run Monday (before adding his requisite walk) in Los Angeles’ 8-3 victory over San Francisco. Even accounting for the small benefit Pederson has gained from batting eighth, it grows harder almost by the day to deny the impact he can have on a game. It was Pederson who kept the Dodgers from falling behind, Pederson who had the biggest hit of their four-run third inning, Pederson who delivered the big insurance run in the sixth. After hitting into five double plays in their first seven innings against Tim Lincecum this year — including a pair of line-drive first-inning twin killings last week and this — the Dodgers finally unloaded on the Giants righty in the third, following a walk with four singles and Pederson’s double to right to take a 4-0 lead. Starting pitcher Brett Anderson was cruising with two out in the fifth, having retired eight batters in a row and 13 of 16 overall (aided by his own first-inning double play, an 8-6-3 of beauty that began with Pederson’s running catch in deep center), but then Anderson suddenly ran aground. He walked Brandon Crawford on a full-count pitch, gave up three consecutive hits and was chased from the game, just like that. Angel Pagan’s RBI infield single off Carlos Frias cut the Dodger lead to 4-3, and a walk to Buster Posey loaded the bases. But Justin Maxwell, who has come from relative oblivion to cause the Dodgers all kinds of trouble this year — including a diving catch robbing Jimmy Rollins of what would have been two RBI in the second inning — grounded out on a comebacker, and the Dodgers escaped the inning. Then in the bottom of the sixth, Pederson knocked his third homer of the season to double the Dodgers’ comfort room, before walking in the eighth to help set up Justin Turner’s three-run pinch-hit homer that busted things wide open. The period where pitchers adjust to Pederson and he has to adjust back certainly awaits, but considering that there was supposed to be a learning curve for the rookie outfielder and that any offense he was to provide at the outset of the season would be gravy, it’s hard not to reiterate how impressive he’s been. For images from Sunday, visit LA Photog Blog. A thousand sighs for this piece of news. 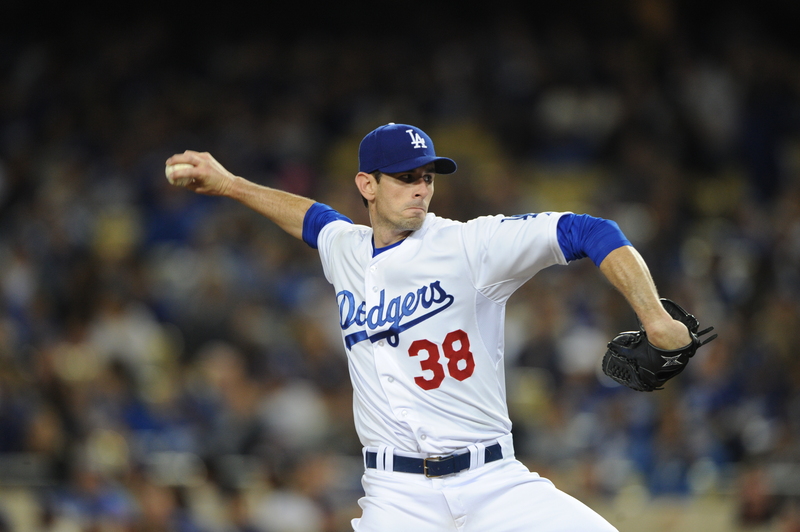 Brandon McCarthy and the Dodgers received the worst possible report today about his injured right elbow, learning that the 31-year-old righthander has a torn ulnar collateral ligament that will almost certainly require Tommy John surgery. With the operation, McCarthy figures to be sidelined until approximately July 2016. It’s like a DH-nado hit baseball over the weekend. Maybe it’s the online circles I travel in, but renewed advocacy for bringing the designated hitter to the National League seems to be everywhere you turn. The spark seems to have been the injuries in the past week to ace pitchers Max Scherzer of Washington (April 23) and Adam Wainwright of St. Louis (April 25) suffered while batting. The discussion actually goes far beyond pitcher health, so I mention this only to explain why this is all happening right now. Craig Calcaterra of Hardball Talk made a number of wide-ranging arguments in his pro-DH piece, followed in short order by such writers as Ken Rosenthal of Fox Sports, David Schoenfield at ESPN.com and Cliff Corcoran and Jay Jaffe at SI.com. Calcaterra had his own follow-up piece today, in the wake of lengthy debate at Baseball Think Factory. Resembling nearly every political debate, there have been legitimate points mixed with straw-men arguments and a tendency to reduce the opposing side to close-minded bullies. And I was really comfortable paying it little mind, filing it away as part of a debate that has spanned nearly my entire lifetime, but today, the conversation seemed to take such a one-sided turn that I felt the need to speak up for the anti-DH side. For more images from Saturday, visit LA Photog Blog — here and here. 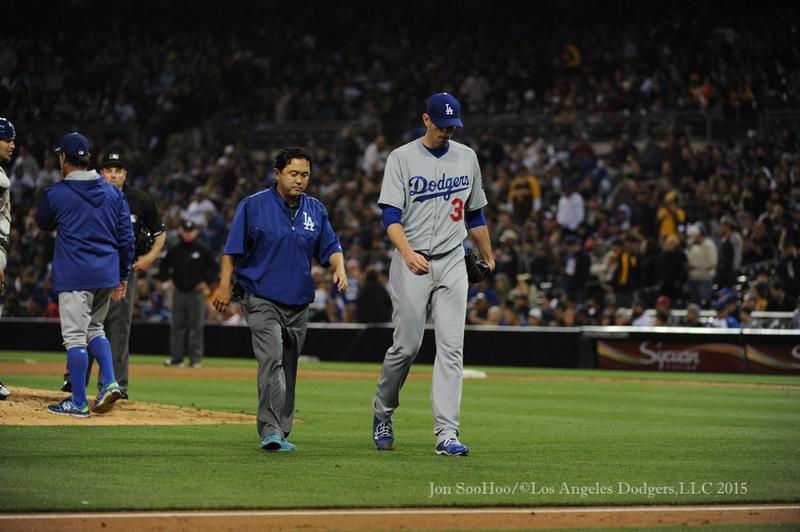 There’s not likely to be any update until at least Monday on the condition of Brandon McCarthy, who reported elbow tightness during his five-inning outing Saturday, after he undergoes an MRI. But two other Dodgers have been placed on the 15-day disabled list today: Yasiel Puig (for the first time in his career) and Joel Peralta. Coming from Triple-A Oklahoma City to take their roster spots are pitchers Carlos Frias and Scott Baker. The latter, as previously discussed, is starting today’s game. Brandon League will move to the 60-day disabled list to make room for Baker on the 40-man roster. As for today’s starting lineup, Howie Kendrick — who had played every inning this season — will begin today on the bench alongside Juan Uribe and the injured Yasiel Puig. Yasmani Grandal, who is 4 for 7 with two walks and two doubles (1.524 OPS) in this series, is batting cleanup. Grandal is fifth among NL catchers in WAR. Justin Turner, who is starting in the No. 5 slot of the batting order for the second time as a Dodger, has reached base eight times this season — four of those a week ago today. Is he for real? Should you have zeal?